As students, you give us money to create an engaging newspaper and to help us become better journalists. The fee you pay to the Polytechnic Ink Publishing Society as part of your tuition goes not only to The Runner but also to Pulp Magazine, our school’s arts and literature publication. We share an office on the Surrey grounds, which some of you may have visited already. For those who haven’t, you’re invited to come by during one of our afternoon meetings on Mondays and Wednesdays to get a better sense of what we do and how you can get more involved. It’s in that office that the staff members of The Runner do most of their work. When our writers and editors aren’t out interviewing, covering events, or researching, they’re plunking away at laptops and holding meetings on the third floor of the library. Our team is small, so it’s easy to keep busy, and all of us are passionate about what we do. Sometimes there are anomalies in that packed but streamlined schedule. For instance, every year, The Runner’s team meets to decide whether or not they want to attend NASH, an annual student journalism conference that takes place in a different city in Canada each winter. We went last year—my first NASH—and learned a lot. I wrote about it in my editorial then, too, and I’ve chosen to do so again because I feel like it’s important that you know what we do with the funds you pay to us. Part of that is understanding how we and, by extension, our community, can benefit from the conferences we attend. This year, PIPS sent five employees to NASH: our Managing Editor Connor Doyle, Staff Writer Braden Klassen, Graphics Editor Kristen Frier, Operations Manager Scott Boux, and myself. Each of us had our round trip to Calgary and conference admission, including three nights of accommodation, covered. This totaled $2,730.60 in hotel fees and tickets and $1,979.74 in flight expenses, leaving the total price of our attendance at NASH at $4,710.34. That’s no small amount of money. Knowing this, we opted to use it wisely. NASH brings student journalists from all over the country together to connect and learn from each other, but it also provides them with invaluable opportunities to meet with titans of the industry. This year, some of the most exciting names in Canadian journalism provided keynotes and led panels in Calgary’s Hotel Arts. Connie Walker, CBC investigative journalist and creator of the award-winning podcast Missing and Murdered, opened up the conference. Suzanne Craig, who broke the history-making New York Times investigation of Trump’s perpetration of tax fraud, spoke on the last night of the event. In between were days full of panels, workshops, keynotes, and get-togethers designed to cover everything from the business of journalism to visual storytelling and reporting on hate groups. During each of the six blocks of programming held daily, attendees could choose from three events. Because every member of The Runner who attended the conference had such a wildly different skill set, we ended up spending most of the conference in different rooms, learning as much as we could to fill the gaps in our own abilities and perspectives. 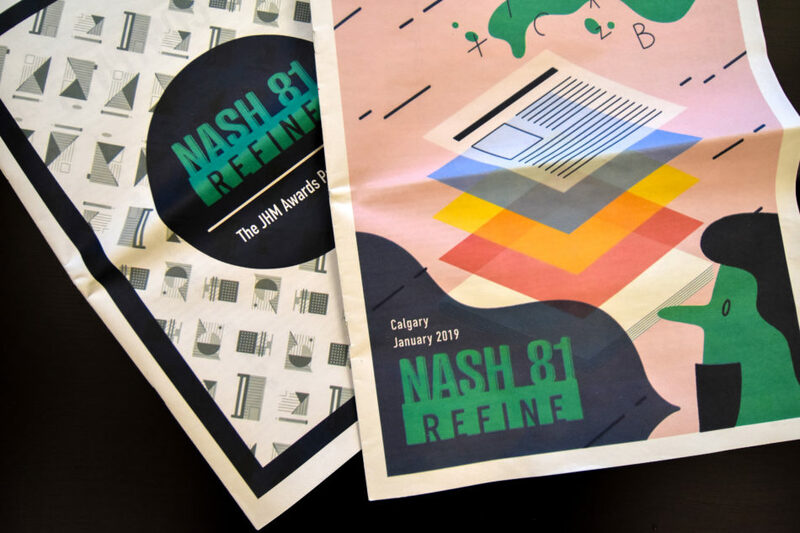 I knew that this year’s NASH was worthwhile when our team arrived at the Calgary airport excited about our work and full of fresh and inventive ideas. We’re starting out the new year with optimism and ambition, ready to take a critical look at ourselves and the world around us. We hope you’ll come along for the ride in 2019 as we do our best to reflect the KPU community in smarter, braver, and more creative ways than we have before.